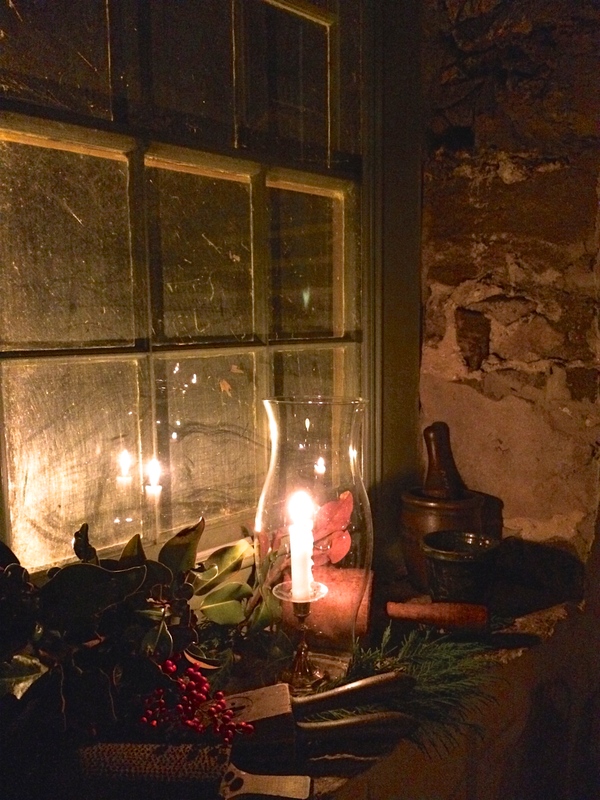 Seeing light even in the dark: Candlelight Tour at Knoxville’s Ramsey House | Oh, the Places We See . 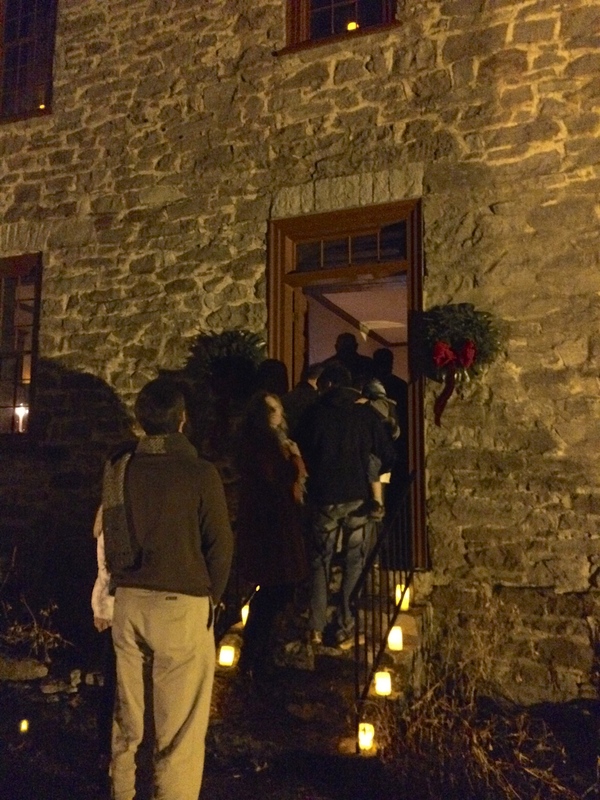 . .
Christmas in Knoxville — well, in most cities for that matter — means holiday tours of historic buildings along with private residences, churches, etc. We never can make them all, so each year we strive to attend at least one function, maybe two. 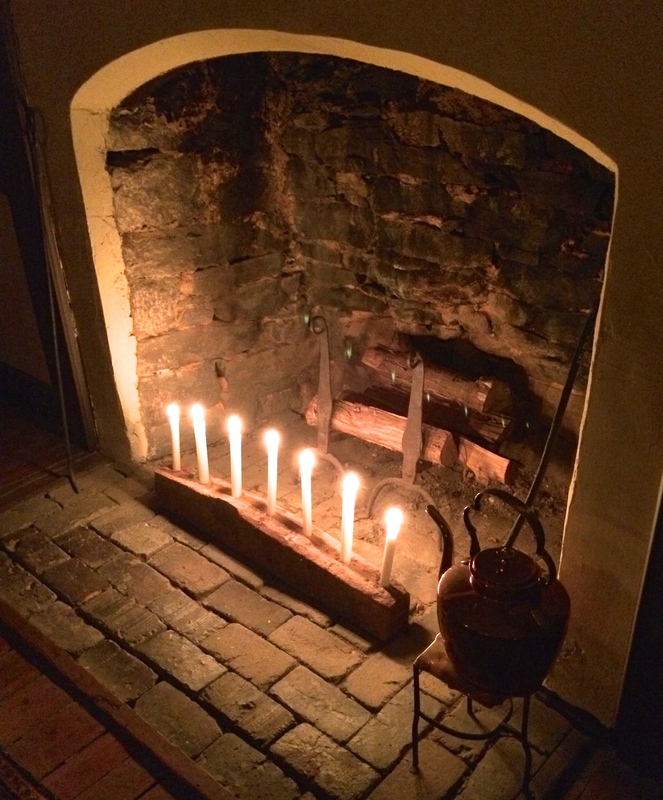 After an amicable greeting by a period-clothed guide holding a lantern, we stood shoulder to shoulder with other guests in the hallway, admiring the banister (found in a nearby barn, no less) while waiting to tour the living room. Although our photos in the dark couldn’t capture the furnishings in the rooms, please take our word for the quality and quantity of beautiful rugs, antique corner cupboards, chairs, side tables, oil paintings, etc. Natural decorations — pine boughs, pomegranates, and berries in keeping with the period — graced the well-selected acquisitions in each room. 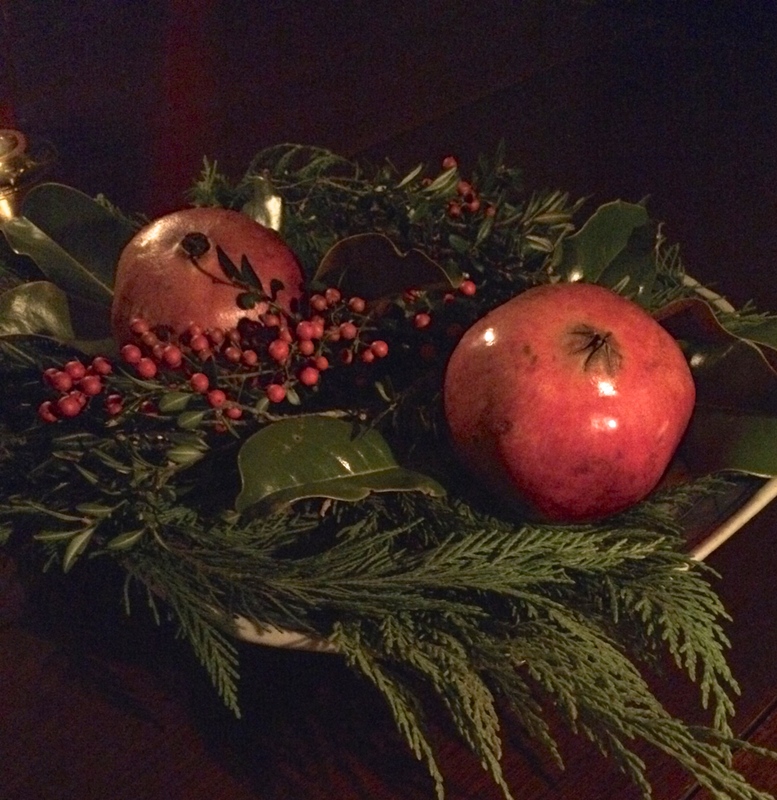 Table centerpiece with natural decorations, Ramsey House. 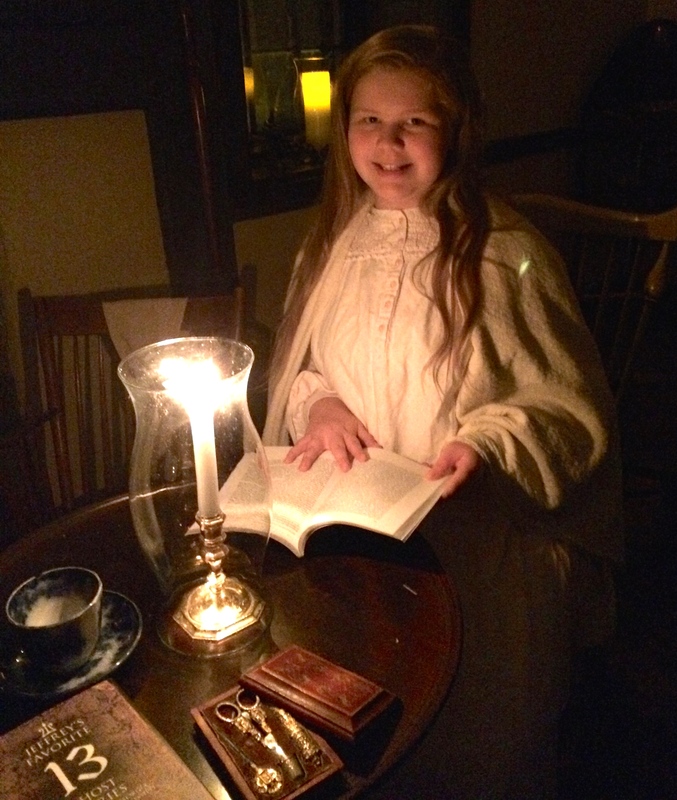 Children in the upstairs bedroom played homemade games or read to demonstrate what children did for fun in the late 1700s. 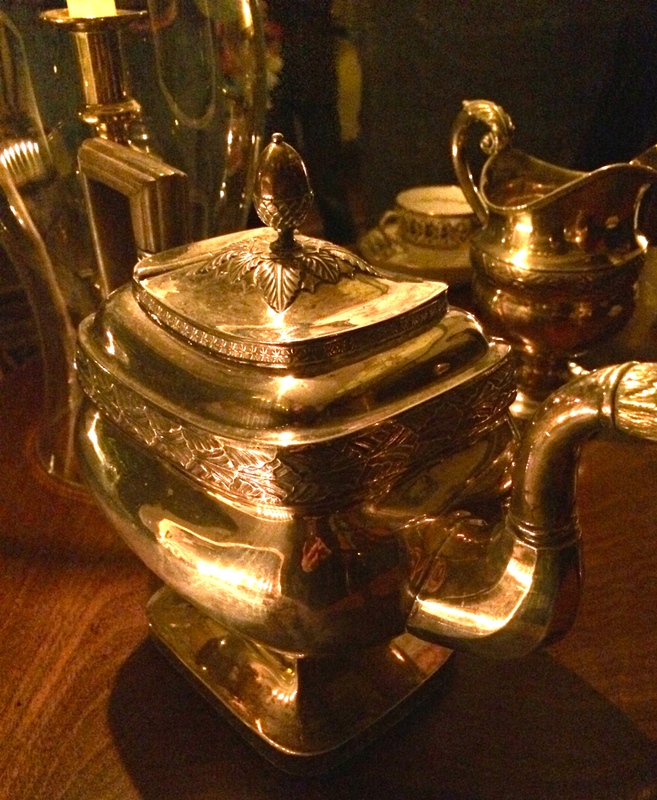 The kitchen, too, held more charms and mysteries — black soot still on the ceiling rafters, a square opening above the fireplace for air, and cooking instruments without a touch of silicone or Teflon®! 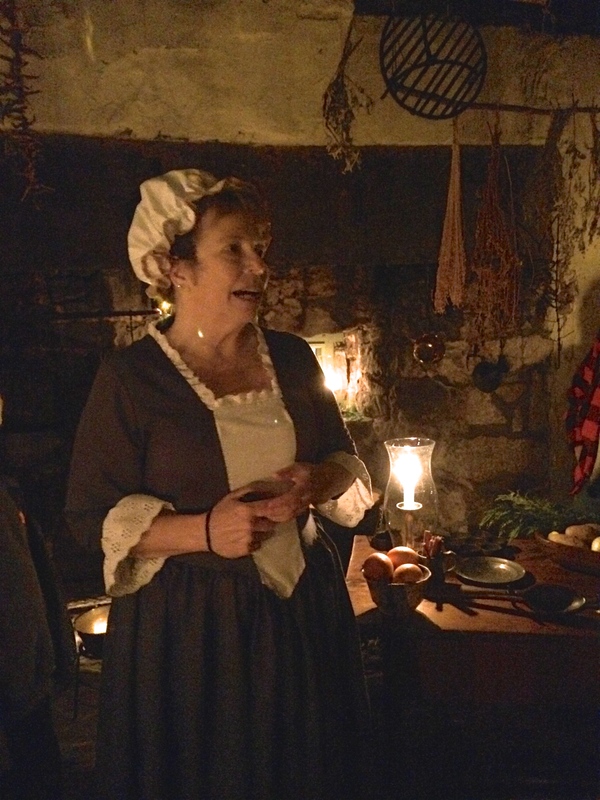 We were told by guides in the various rooms that the Ramseys were people of means; therefore, children were engaged in learning, and the property was frequently abuzz with activity and guests. Colonel Francis A. Ramsey was a founding trustee of Blount College, now known as the University of Tennessee, and B. A. Ramsey served as mayor of Knoxville and later Secretary of State for Tennessee. 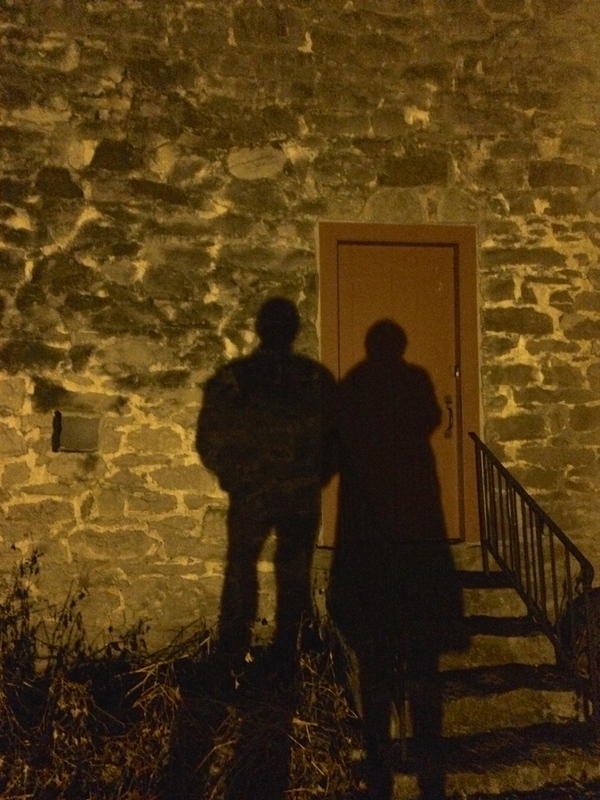 On the way out, we stopped to take a touristy shadow picture since spotlights were positioned on that classy stone exterior. And when we stopped for hot cider and cookies at the Visitor Center, we promised ourselves a return trip during daylight hours. (Why is it we tour historic houses and structures in other cities, but put off seeing the beauty in our own home town?) 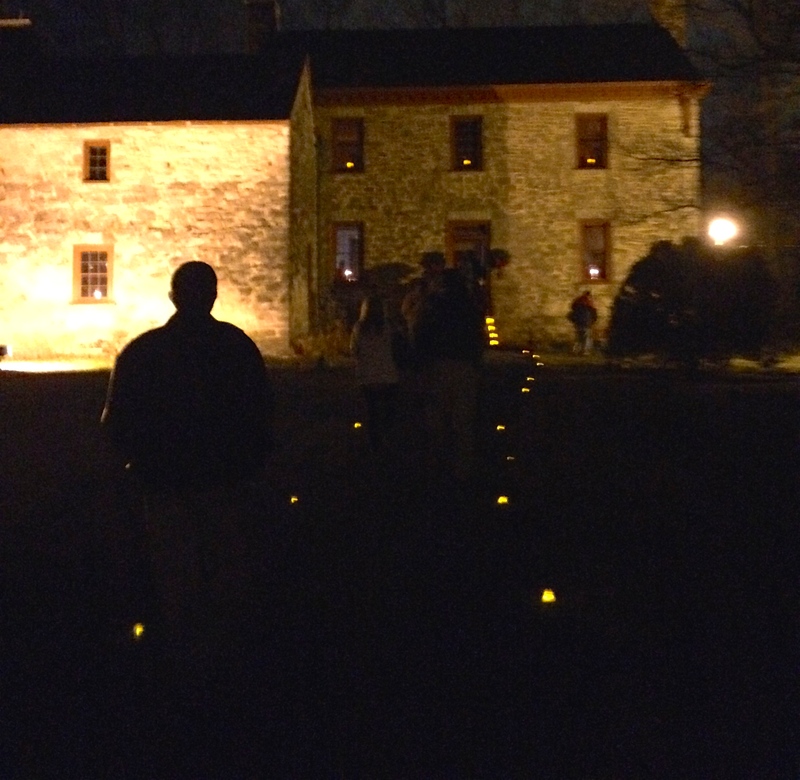 After all, Ramsey House bears a closer look — it’s one historic venue worth seeing again and again. 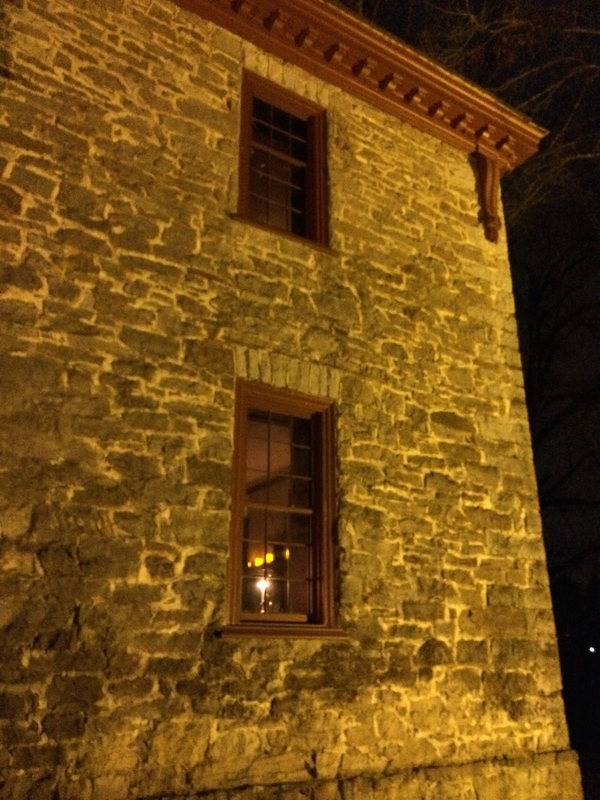 Ramsey House shows off its unique construction of Tennessee pink marble and blue limestone even in the dark. This entry was posted in Travel and tagged B. A. Ramsey, Col. Frances A Ramsey, historic homes, Knoxville, Ramsey House, Tennessee pink marble, Thomas Hope. Bookmark the permalink. Still enjoying all your wonderful trips and especially your writing..What a beautiful gift you give us. Thanks so much, Vandy. It’s readers like you that keep me going. Best wishes for a terrific 2015! Thanks for reading and commenting! 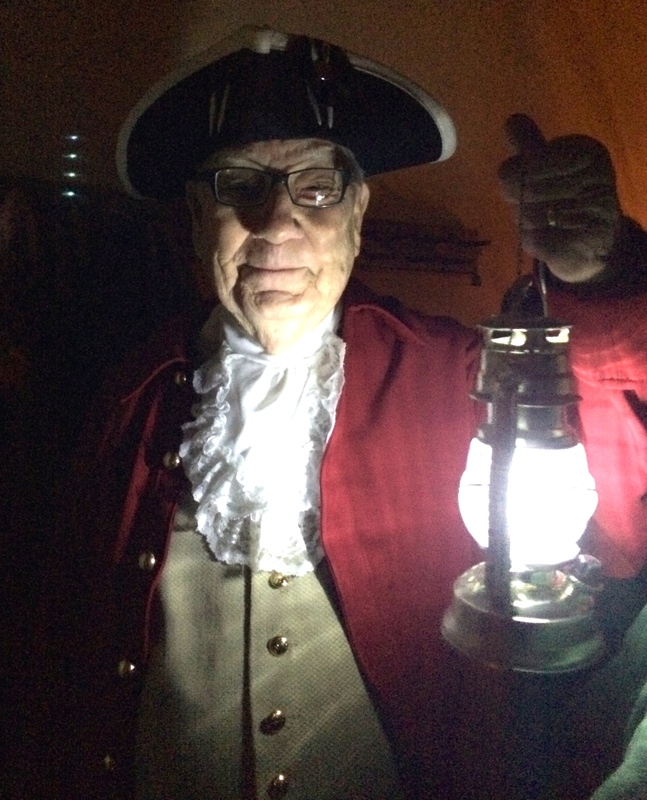 We loved our tour and can’t wait for a return in daylight hours. The shadow pic is a fave of mine, too. I don’t mind one bit acting a bit silly — even on my blog! Thanks so much. You’ve been so good to read and respond to our blog posts this year. May you and yours have a wonderful holiday together. Looking forward to reading more of your posts in 2015.